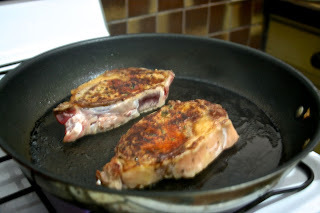 This week's recipe was picked by my lovely OH (Other Half) who naturally, like many men out there love's his meat! I just knew flicking through my Jamie books that this was one he would go for pretty quickly and low and behold it's week 2! 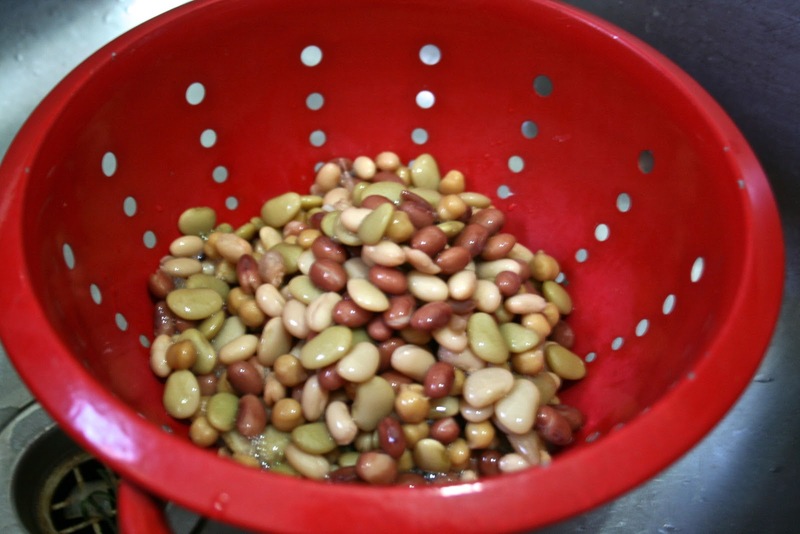 Baked beans are one of those things that sit in your cupboard for months or even years and while we don't mind eating they are just a little... boring. I love the idea of taking this family staple and turning it into something special and cannot wait to see how it turns out. This will also be my first 15 minute meal since buying the book so I am really interested in how long it takes to cook and will be timing myself. Note: due to oncoming headache this weeks photo's are not so good.. my bad! Before you start it is recommended (in order to complete in 15 minutes) that the ingredients are out, kettle boiled, oven at full whack 240°C, large lidded pan at medium-hgh heat, medium ovenproof fry pan medium heat, large fry pan high heat. Start the pancetta, out it into the lidded pan with 1 tablespoon of oil, then pick in the herb leaves. Trim, finely slice and add the carrot, spring onions and radishes, stirring regularly. Drain and rinse the bans and put into the medium frying pan with 2 tablespoons of oil to fry and crisp up. Slice the kale (if needed) and add to the lidded pan, crumble in the stock cube and pour over 300ml of boiling water, then put the lid on. Stir the remaining bean ingredients (except the cheese) into the beans pan and bring to the boil. Grate over cheddar then place into the oven until golden and sizzling. Rub the steaks with salt, pepper, paprika and thyme. Put them into the really hot large fry pan with 1 tablespoon of oil, turning every minute until cooked to your liking. Slice the chilli and add to the bottle of vinegar with a couple of bay leaves then add a drizzle to the greens before serving. 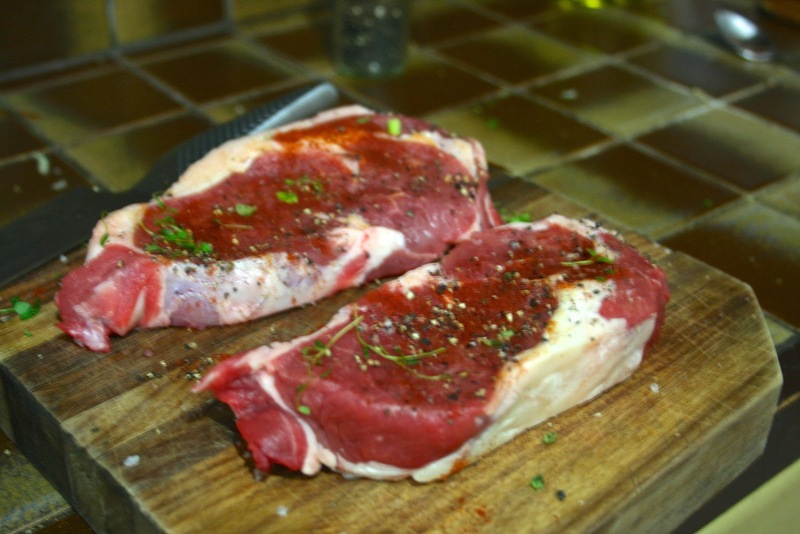 Carve the steaks on a board at the table and serve with the beans, greens and a splurge of mustard. Changes Made: Could not find kale, not even sure if we can get it here is Australia and after some research found pak choy to be an adequate substitute, not really in the cajun theme but oh well! Also BBQ sauce in place of HP. Results: Delish! 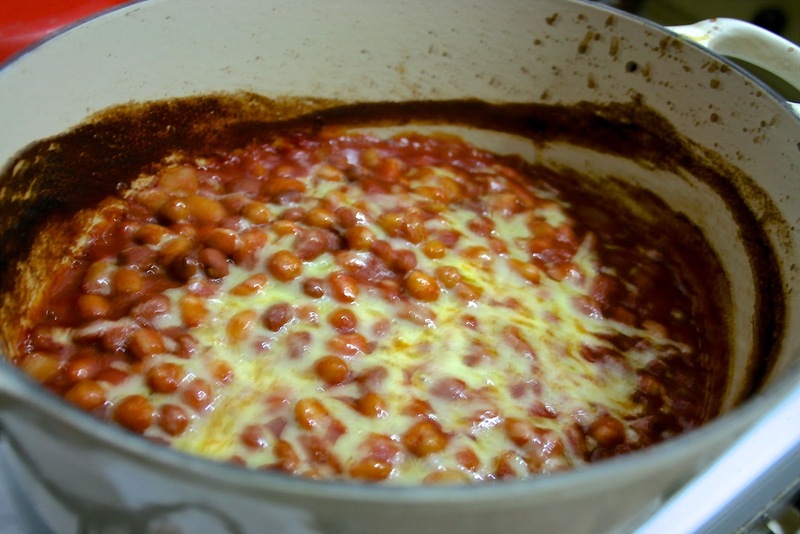 This dish worked really well and just goes to show how good baked beans can be! The collard greens ended up a bit soupy but the flavour was really good. Unfortunately a head ache made me forget to time myself but I think it would have been close to 25min. Jamie recommended to have all ingredients out and ready to go, which I did not, and wanted you to have 3 separate pans on the go to begin with which I don't even own. Overall I think this is a totally doable weeknight dinner and one the men will love. 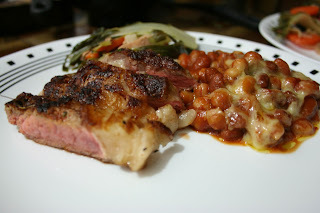 Next Time: Use mustard, not hot english mustard as my baked beans had quite a kick! Also less water for the greens. Not much to change on a simply good meal. I see you took the challenge of cooking Jamie Oliver's famous 15-minute Cajun Chicken. What I love about this recipe is the combination of herbs for a taste that is pleasurable to the palate. Aside from pan searing the chicken, you may grill it for added texture on the crust or skin.